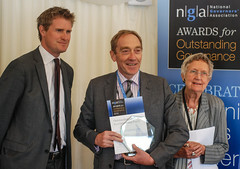 Yesterday the National Governors’ Association held its annual awards ceremony in recognition of those who have been judged to be outstanding in school governance. 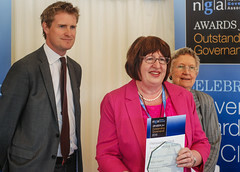 The awards recognise exceptional governing and trust boards from schools and academies as well as the clerks who perform a critical, but often little-appreciated and understood role in supporting school governors. The judges were looking for good organising skills; a scrupulous attention to the basic mechanism of running a governing board; a thorough understanding of what the role and functions of a governing board are; knowledge of the law as it relates to governance; an ability to get on well with people, especially in the key relationships with the chair and head; the ability to be the governing board’s critical friend; and something special that they have brought to the governing board beyond the basics. David Walker from St George’s Church of England Academy. The second award is for an Outstanding Governing Board in England, who by its good governance has increased opportunities for achievement by their children and young people. The part played by the governing board in achieving that had to be demonstrated. “The school has progressed from ‘satisfactory’ to ‘good’ to ‘outstanding’ in terms of Ofsted inspection and is now a teaching school. “The breadth of experience and skills of the governing board are wide ranging and their expertise has enabled them to challenge leaders well, holding them to account for the progress made by all. The vision of the college – “excellence for all” – has resulted in an outward-facing school prepared to not only share its experience and knowledge but also continue to learn in the process. Congratulations to all of the finalists – and to the volunteer judges, who were clearly inspired by what they saw when they visited governing boards around the country. We’ve a gallery of images from the awards ceremony, including all of the finalists, on Flickr, but before you look at those, why not contemplate which of the following questions you might like to answer at your next full governing board meeting? Read the citations for the six governing boards. Do any of the situations these governing boards have worked in mirror your school’s? What can you learn from them? Likewise, read the citations for the clerks. Do they exceed the expectations your governing board has for its clerk? If so, how might you address that to ensure that you get the most out of the person who attends your meetings to support you in governance? How does your board need to change the way it uses its clerk? How would you rate your governing board in its performance and effectiveness? Good in all areas? Where could you improve? Would you know how to start that process? What would you hope would be ‘outstanding’ about your governing board this time next year? Will you nominate your board for the 2016 Outstanding Governance Awards?